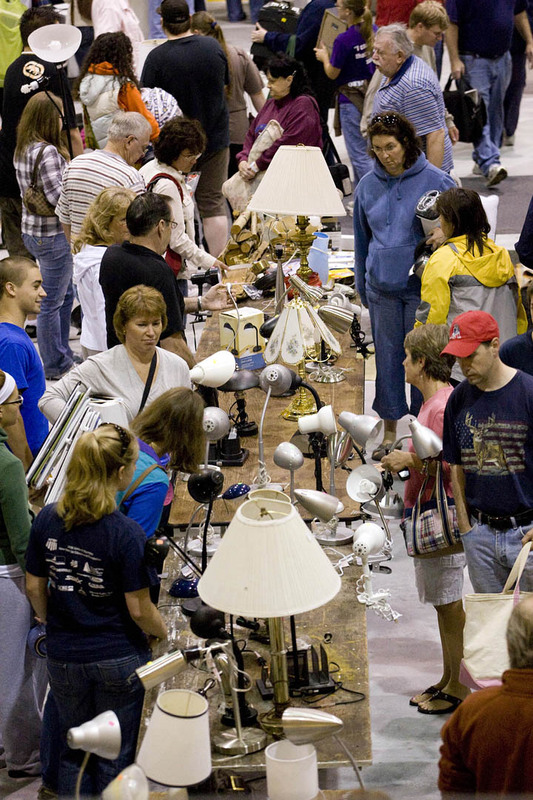 Bargain hunters descend on Underhill Arena for Bate’s popular Clean Sweep sale. A “garage sale” on a massive scale that benefits the environment, community organizations and countless satisfied shoppers, Bates College’s Clean Sweep returns for the 13th year from 8 a.m. to 3 p.m. Saturday, June 15, at Underhill Arena, 145 Russell St.
As students pack up to leave Bates at the end of the school year, they donate to Clean Sweep all kinds of still-valuable possessions — electronics and toys, household goods and small furnishings, bikes and books, sporting goods and more. Faculty, staff and the college itself also donate items. It’s a win-win-win-win situation: Shoppers find treasures at bargain prices, still-usable goods are kept out of the waste stream and the proceeds go to local nonprofits, who in turn supply volunteers to staff the sale. To learn more, please call 207-786-6207. Bates is one of a number of colleges and universities nationwide that hold such sales. Last year’s event at Bates raised a record $21,223 that was divided among 14 local nonprofit organizations. Also, the Justice, Ecology and Democracy Collective, Greene; the Life Center at John F. Murphy Homes, Auburn; Lots to Gardens; the Root Cellar; the Share Center, Auburn; Somali Bantu Community Association; TriCounty Mental Health Services and its Social Learning Center; and the Trinity Jubilee Center.